Chlorine dioxide is an unstable compound. Solutions using this compound must be prepared in the place they are to be used. It is obtained by oxidising a solution of sodium chlorite using chlorine or hydrochloric acid. From a stoichiometric viewpoint, we need 1.34 g of sodium chlorite and 0.526 g of chlorine to produce 1 g of CℓO2. This process involves plants that have chlorine gas that is used for preliminary oxidization purposes or at any point on the treatment line. The pH of chlorine water must be between 1.7 and 2.4. Its concentration may vary between 2.5 and 6 g.L-1 Cℓ2. When there is a high TAC, chlorine water will have to be used at the highest possible concentration level. Chlorine water is brought into contact with a concentrated solution of NaCℓO2 (commercially available solution at 310 g.L-1) inside a contact tower lined with Raschig rings. Inside this tower, contact time must never exceed 10 minutes (optimum time = 6 minutes). The chlorine dioxide solution is transferred using injector service water in a storage tank before being dispensed into the network water system. In this tank, the CℓO2 solution is diluted (0.5 to 1 g . L-1) and remains stable for longer (24 hours). In practice, based on a 10% chlorine excess compared with the stoichiometry and a 95% efficiency, 1.41 g of pure sodium chlorite and 0.61 g of chlorine will be required to produce 1 g of CℓO2. From a stoichiometric viewpoint, we need 1.67 g of NaCℓO2 to produce 1 g of CℓO2. This CℓO2 production process is put in place in plants that do not have chlorine gasor facilities for storing chlorine gas. hydrochloric acid in a 32% solution (370 g . L-1). A 25% volume of sodium chlorite is mixed with approximately 0.65 by volume of concentrated hydrochloric acid and 6 volumes of primary dilution water to produce a 17 g · L–1 chlorine dioxide solution. In this way, one litre of NaCℓO2 at 25 % produces 125 g of CℓO2. 6 minutes is the optimum reaction time. 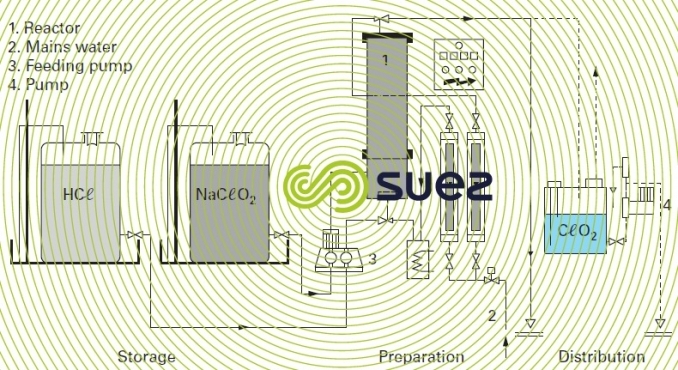 The CℓO2 solution is collected by the injector and diluted accordingly before entering into the storage tank. When it is not diluted at the reactor outlet, the concentrated CℓO2 solution must be dispensed without delay. In effect, this solution is not stable and will break down into CℓO3– and CℓO2–. Diluted CℓO2 solutions (CℓO2 concentration between 0.5 and 1 g · L–1) must be used within 24 hours maximum. Sodium chlorite solutions can be prepared from sodium chlorite powder. Water that has first been softened will need to be used to prevent calcium carbonate from precipitating. Concentrated NaCℓO2 solutions are sensitive to cold. A 25% NaCℓO2 solution will begin to crystallise at about 10°C. Sodium chlorite and hydrochloric acid solutions must be stored in premises heated to a temperature of 15°C.